Nose correction procedures can range from minor interventions to the more complicated open nose surgery in Thailand involving the underlying structure of the organ for breathing. This procedure is mainly plastic surgery in nature as it aims not just to improve the physical appearance of the nose, but also to correct the it’s functional features. WHAT HAPPENS DURING YOUR CONSULTATION FOR NOSE CORRECTION SURGERY in Thailand? During your consultation with Prof. Somyos Kunachak, one of the best nose surgeons in Thailand, regarding nose correction surgery, he will fully evaluate your nose structure from different angles before recommending the best approach for you. He may ask questions such as your breathing rhythm, or your sleeping habits in order to assess if you have an existing breathing problem that can be addressed at the same time during this surgery such as those functional problems associated with blocked nose caused by septal deviation or enlarged nose tubinates. For reconstruction surgeries such as those who had prior nose injury or for repeat rhinoplasty, the procedure will be trickier and the result will not be as predictable due to scar tissues that has already formed in the area. Even in cases of patients who previously had filler injections, reconstruction, reshaping, or revision wil be a lot more complicated than for primary rhinoplasty. We highly encourage full disclosure of your medical history during consultation so our surgeon will be able to advice you accordingly. Not mentioning previous procedures done on your nose, whether for functional or cosmetic purpose, may increase the risks associated with your nose correction in Thailand. WHAT HAPPENS DURING NOSE CORRECTION SURGERY in Thailand? The procedure will start with the administration of anesthesia which depends on what you and our surgeon, Prof. Kunachak has discussed during your consultation. 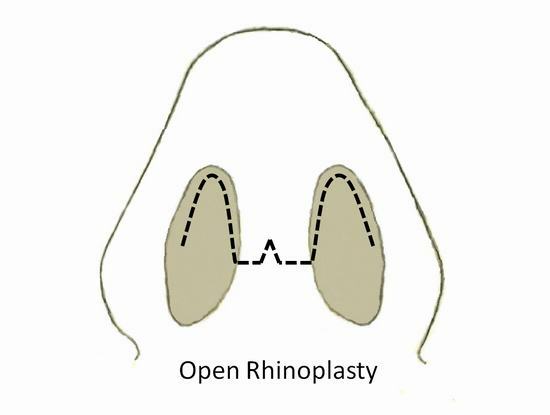 The technique can either be a closed rhinoplasty or an open method. With Closed Rhinoplasty, the incision will be hidden inside the nostrils and the surgery will mostly involve tissue and cartilage manipulation with minimal bone reduction only. Closed Rhinoplasty is Thailand is usually done under local anesthesia. For Open Rhinoplasty, the incision will be partly across the columella which may be visible during the first 2 weeks but usually, usually heals well over time. Open Rhinoplasty can also be done under local or general anesthesia and may involve bone manipulation and/or bone reduction. Should bone manipulation be involved such as for septoplasty and/or osteotomy, general anesthesia is mostly recommended. 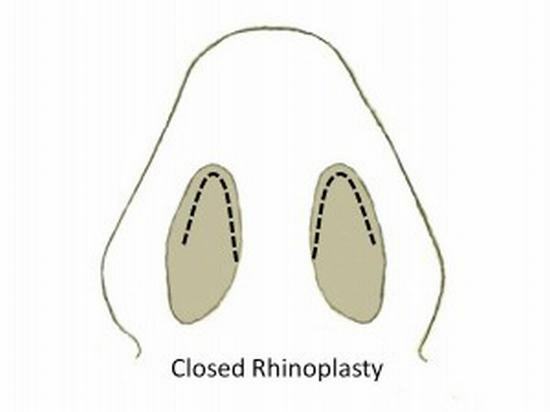 For revision rhinoplasty, open rhinoplasty technique will naturally be required. Prof. Kunachak is one of the go-to surgeons for revision rhinoplasties from other surgeons in Thailand. Other plastic surgeons even refer patients to our center if their cases are too complicated since our surgeon is also an ENT specialist. Open Rhinoplasty is the more precise approach to nose correction as your surgeon will be able to fully visualize the underlying structure of your nose therefore the result will be more defined. Though with Prof. Somyos Kunachak’s more than 30 years of experience in this field, he has refined his technique with both open and closed rhinoplasty in Thailand. WHAT HAPPENS AFTER NOSE CORRECTION in Thailand? An open rhinoplasty will cause more swelling and bruising than a closed method, but usually, the amount of time it takes for the result to settle is not significantly different from each other. Bruising around the eyes is to be expected, especially with the open rhinoplasty approach in Thailand. Cleaning of the nose after surgery should be as gentle as possible, though a trip to our clinic for follow up will be advisable especially if you do not have a support person to assist you in cleaning the area. Staying in our adjacent hotel, Aphrodite Inn, is however advisable to assure that you will receive proper post-operative care and pampered by our team of surgeons and nurses as well as hotel staffs. Glasses or shades should be avoided for at least 6 months as it may leave a dent or a mark on apex of your nose. Contact sports should also be avoided for at least 6 months to allow the underlying tissue to properly heal first as external pressure may damage the nose again especially if the result hasn’t settled yet. Aside from having one of the most gifted nose surgeons in Bangkok, our clinic also take pride in offering a whole package of accommodation from our nearby hotel, Aphrodite Inn, which sits adjacent to our facility with a connecting door on the 2nd floor for patient privacy. The 2nd floor of Aprodite Inn was also converted to suit the needs of our patients, pre and post-operatively. Each room is equipped with mechanical beds, with hotel quality mattresses, and oxygen outlet for patients who just had surgery. Medical equipments and emergency apparatuses are also within reach from the rooms so there will be no need to worry about recovery.